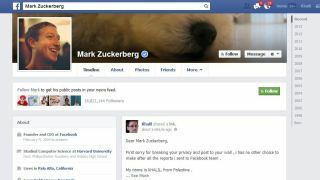 A frustrated security expert sick of being ignored by Facebook's people took to Mark Zuckerberg's personal Facebook wall to report a security vulnerability that allows strangers to post on anybody's wall. Unfortunately for Khalil Shreateh, he isn't eligible for the $500 bonus that you usually get for reporting a security flaw because he broke Facebook's Ts & Cs by hacking its CEO's profile. Post some blips on strangers' Facebook walls, if you like. Cheer up, love - is Facebook making us all feel sad?